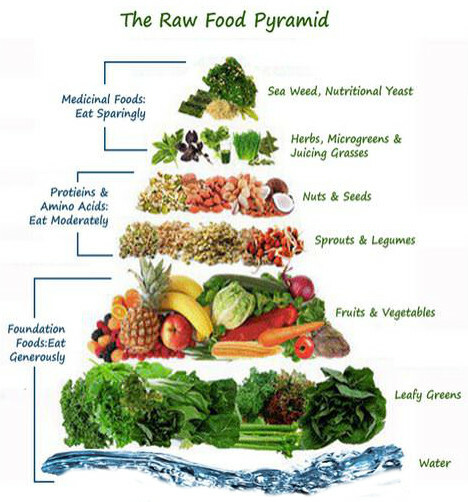 Here is a standard raw food pyramid. There’s a bunch of them online. The thing to remember is that they’re just guides. Eventually, as you clear the toxins and addictions that block your body’s innate ability to sense or “know” what you need nutritionally, you can tune into what is right for you individually — but that may not follow some pyramid design. However, in the beginning you may need a guide to make sure you get all the nutrients you need from a variety of organic, raw sources. A raw food diet consists of uncooked, unprocessed and organic fruits, vegetables, leafy greens, nuts, seeds, sprouted grains and beans and dried fruits. There are also some other foods that are included in this diet such as young coconuts, seaweeds, raw carob, cold pressed oils and fresh or dried spices and seasonings. The benefits of eating a balanced diet consisting of live, raw foods include increased energy, improved digestion, healthy weight loss, improved appearance and eliminating the risks of heart disease, diabetes, cancer and the other so-called dis-eases of civilization. Heating over 118°F can kill essential enzymes in food that help in digestion and absorption. Cooking can also diminish the nutritional value and living energy of your food. But the worst thing is that heating food actually breaks down the chemical structure of the food, replacing most of delicious nutrients with a variety of toxins and carcinogens. Cooking Creates New Toxic Substances In Food.